April 18, 1930: “The Gumm Sisters” (Judy and her two sisters) performed at the Knight of Pythius District Convention. April 18, 1932: The last of a two-night engagement for Frances (Judy) at her father’s theater, the Valley Theater, in Lancaster, California. April 18, 1940: More music rehearsals for Judy and Mickey Rooney on the “Gay Nineties” number for Strike Up the Band. Time called: 9:00 a.m.; dismissed: 6:00 p.m. 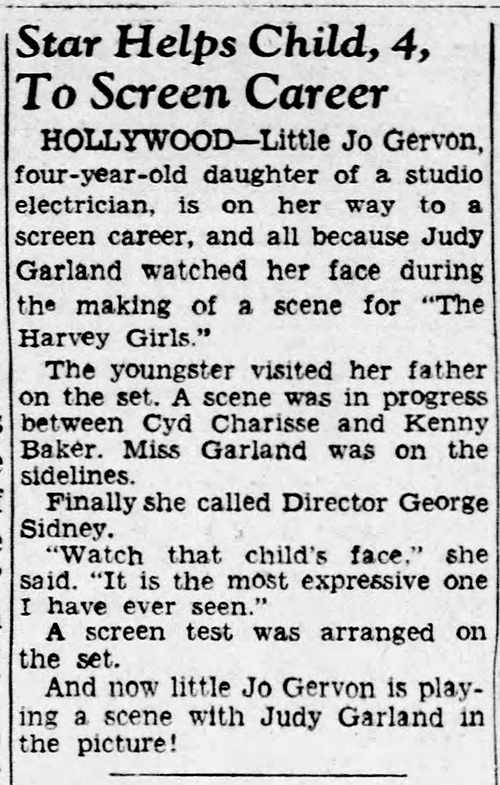 The assistant director’s notes stated that “shoot tests Mickey Rooney and JG” were also done. 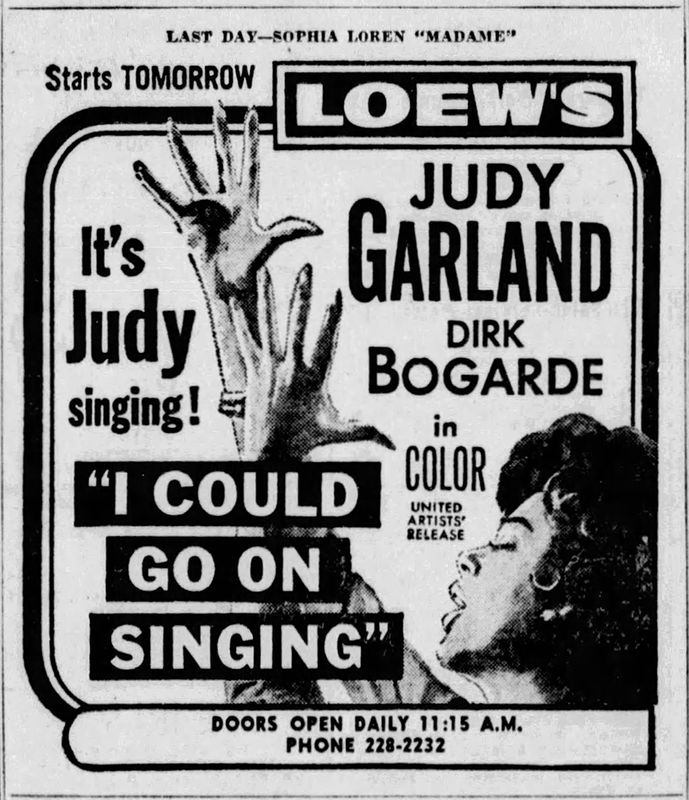 April 18, 1942: Judy was ill and left MGM at 9:00 a.m. She was scheduled for more filming on For Me and My Gal. 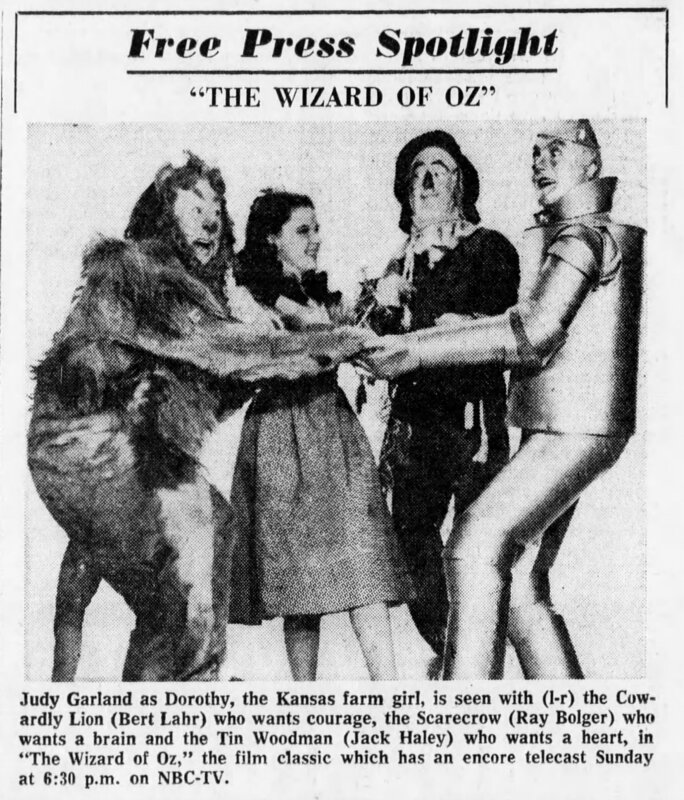 April 18, 1943: This article, written by Kate Holliday for the Associated Press, is dated April 17 but it also appeared in newspapers as early as April 11, 1943. 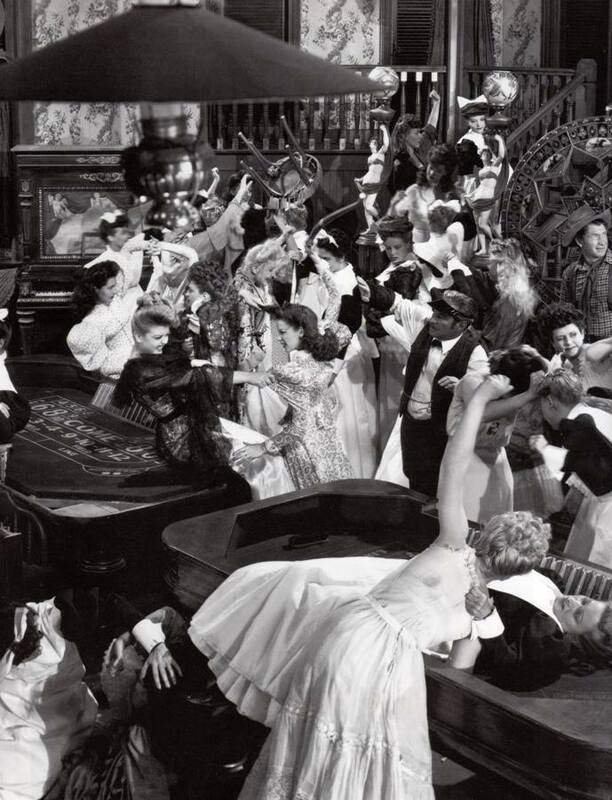 It’s fiction from the creative minds at the MGM publicity department with just enough facts to make it believable. 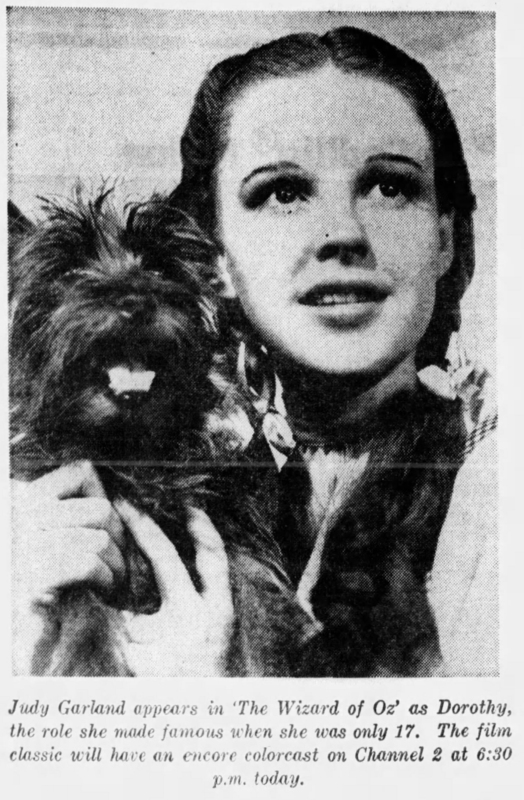 Hollywood, April 17 – (Associated Press) – Judy Garland, at 20, is neither child nor woman, a circumstance which often obtains with youngsters who grow up in the theater. She is neither entirely mature nor her own age, yet she is completely charming. 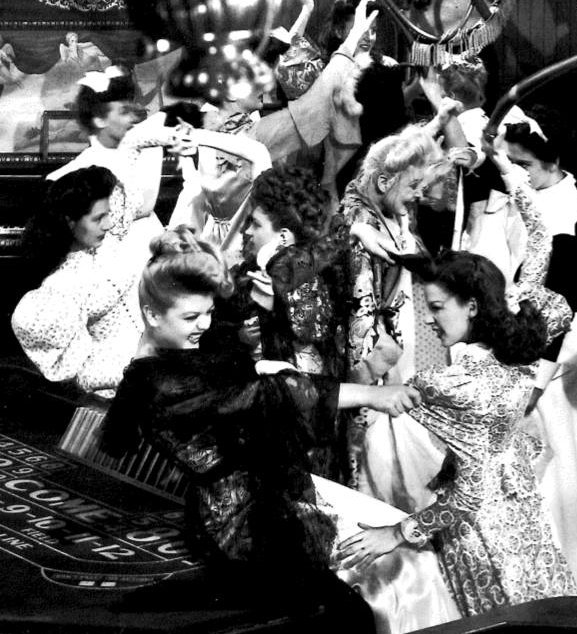 April 18, 1945: The Harvey Girls filming consisted of the fight between the “good girls” and “bad girls” on the “Interior Alhambra” set. Time called: 10 a.m.; arrived: 10:15 a.m.; dismissed: 5:35 p.m.
Also on April 18, 1945: These items appeared in the gossip columns. They might be true or they might not. 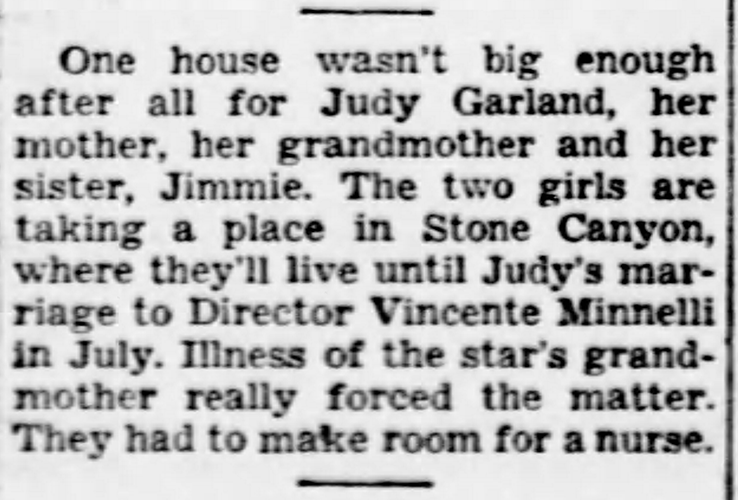 The first is from Harrison Carroll’s column and makes a note about Judy’s living arrangements. 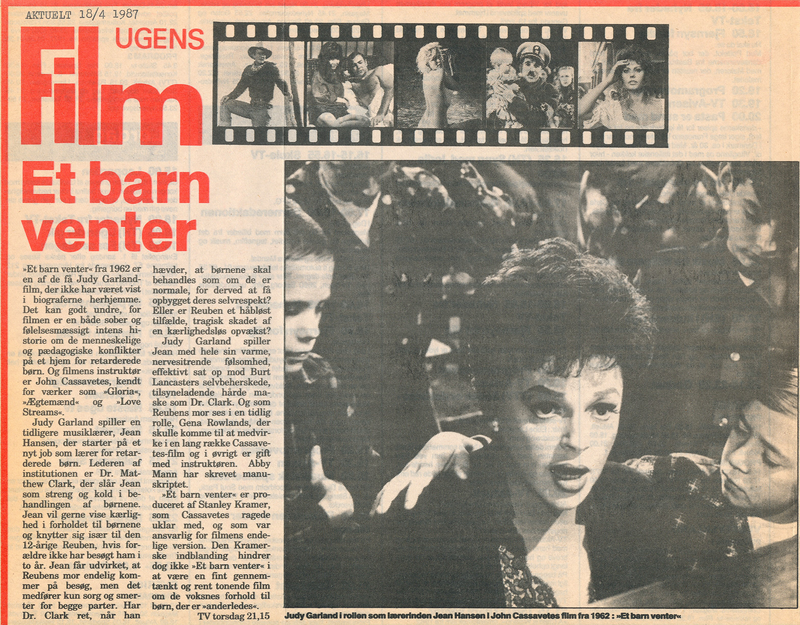 The second is an uncredited story about Judy helping an electrician’s daughter to a screen career although if true the career didn’t happen. 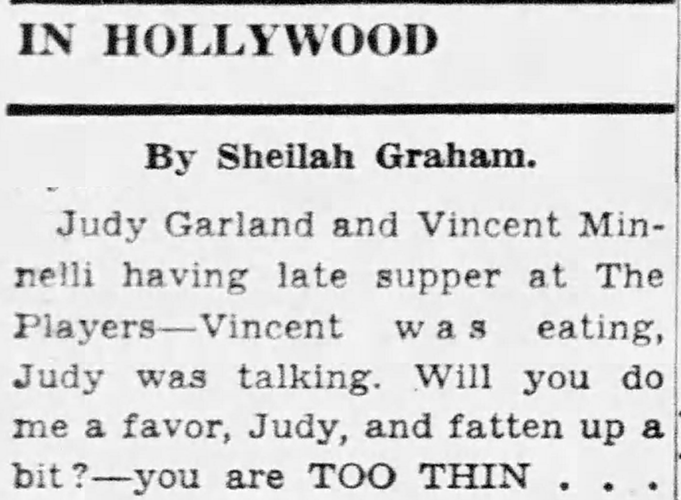 The third is Sheila Graham’s column noting that Judy is too thin. 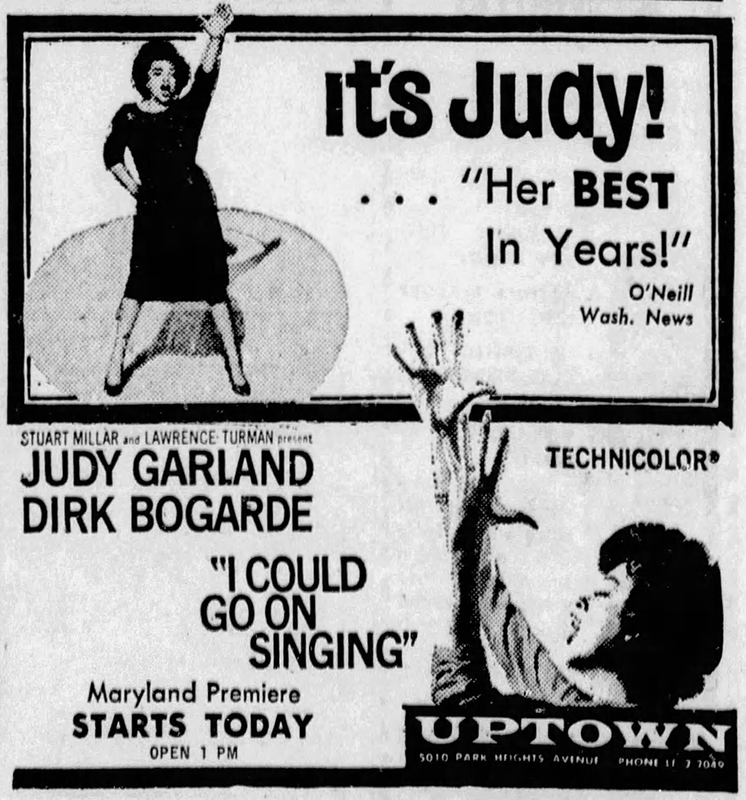 The columnists loved to talk about Judy’s weight whether she was thin or heavy. Is it any wonder she was insecure about her appearance? 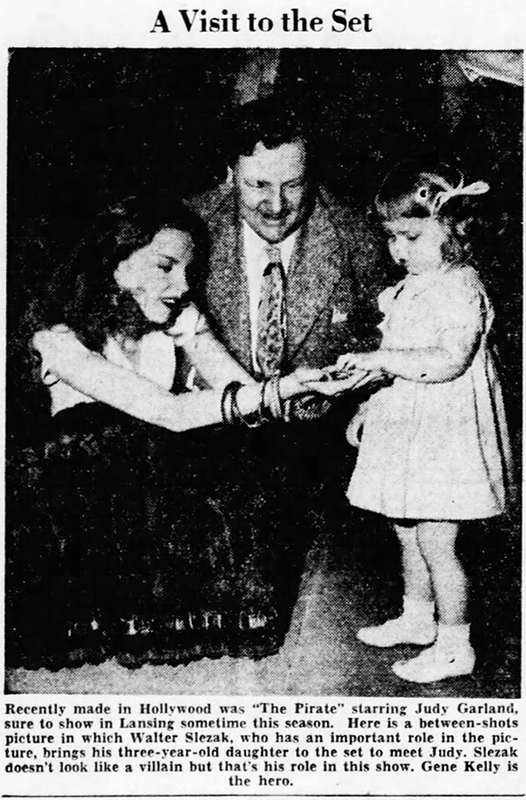 April 18, 1948: Judy and Arthur Freed attended a party at the Mocambo that Freed gave for Perry Como. 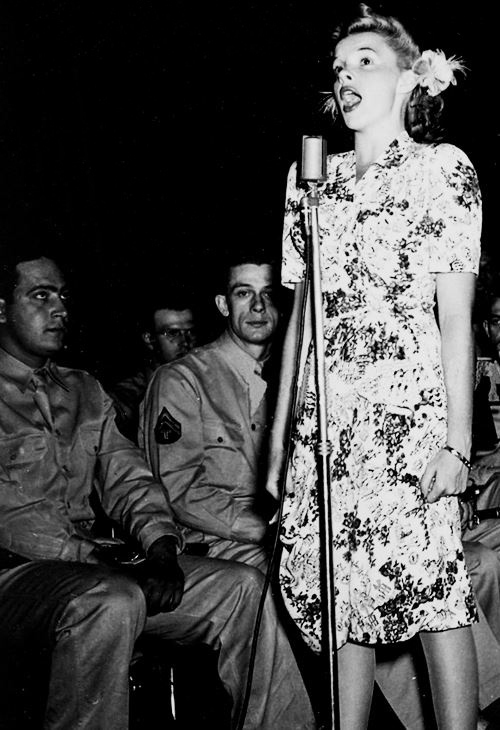 All three are seen in this photo taken at the event. 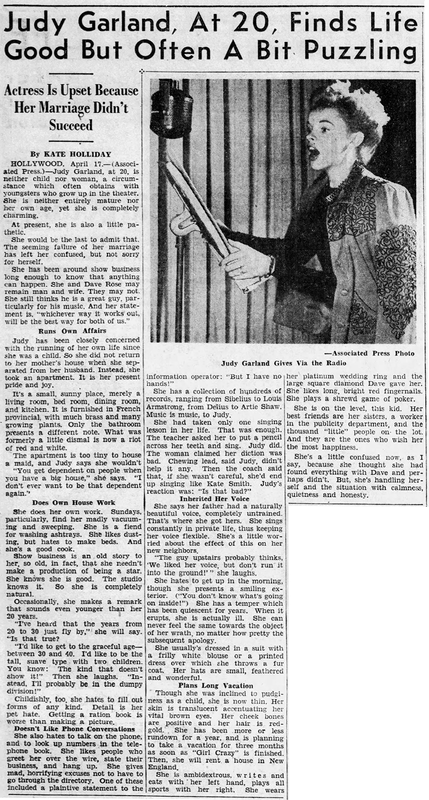 At this time Judy was on a two-month vacation after having completed the filming of both The Pirate and Easter Parade and had become quite thin and worn out. 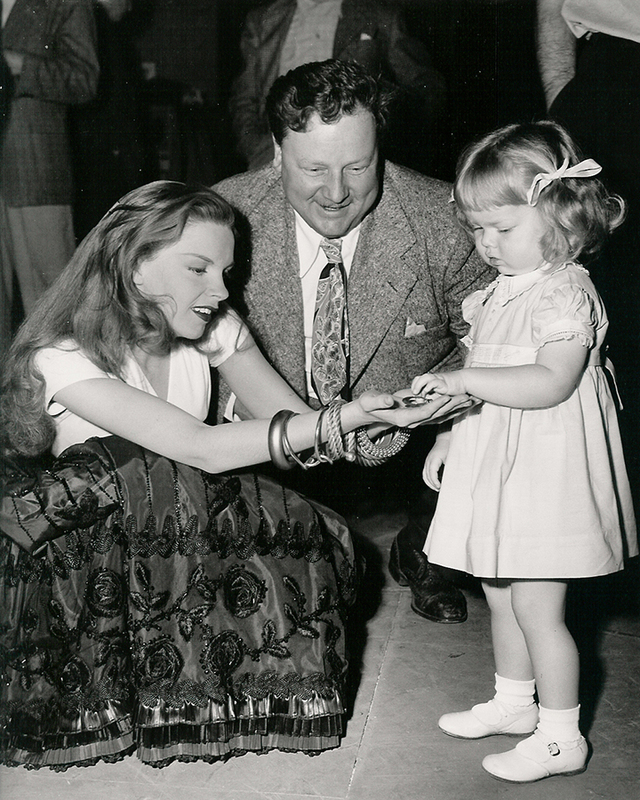 Also on April 18, 1948: This photo of Judy with co-star Walter Slezak’s daughter on the set of The Pirate was sent out to promote the film. 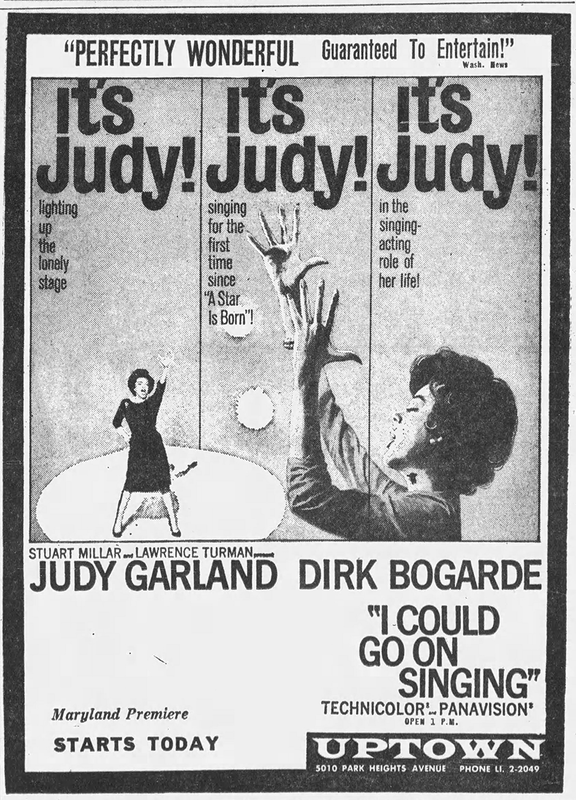 Judy is in her “Voodoo” costume which also became the “Mack The Black” costume when it was decided to ax the former and replace it with the latter. This photo was taken during the “Voodoo” filming as Slezak’s had completed his scenes for the film before the “Mack The Black” retakes. The Pirate was released on June 11, 1948. 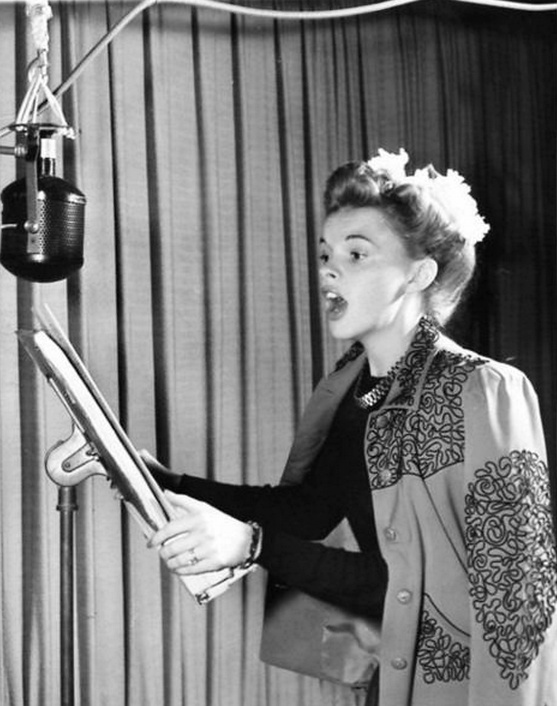 April 18, 1949: Judy had a rehearsal of “I’m An Indian, Too” for Annie Get Your Gun. 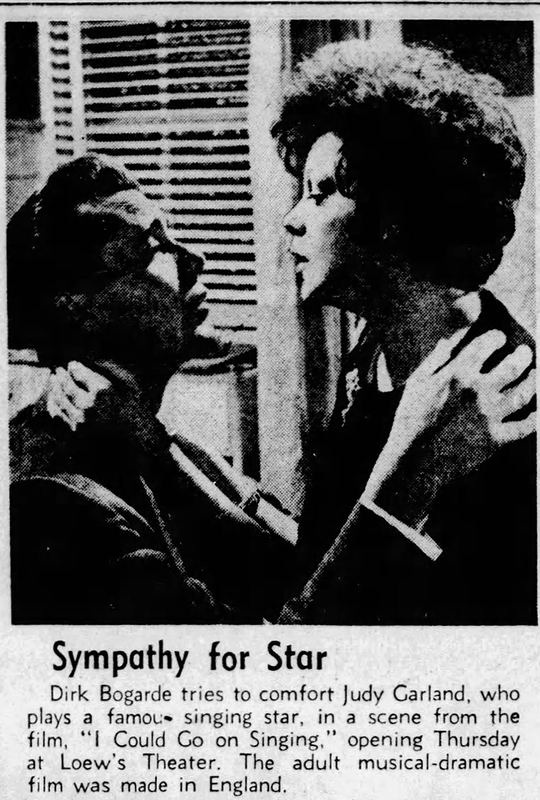 The assistant director’s notes state “JG with Alton Unit.” Judy was due on the set at 2:00 p.m., she arrived at 1:50 p.m. (10 minutes early); dismissed: 4:30 p.m.
April 18, 1963: Judy’s last film, I Could Go On Singing, was currently playing in theaters nationwide. 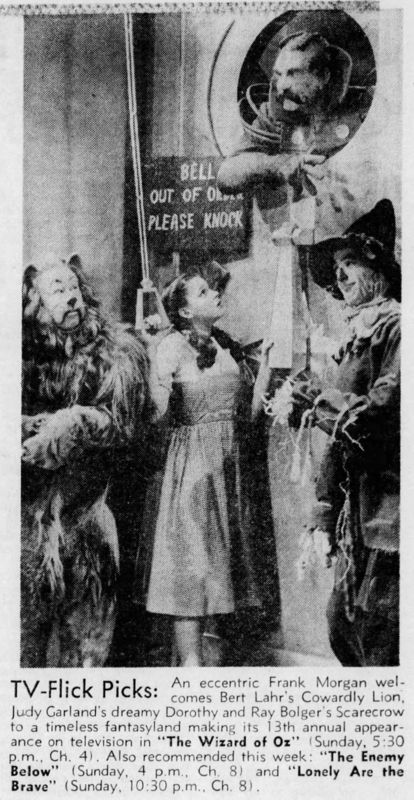 April 18, 1971: The annual broadcast of The Wizard of Oz on network TV. 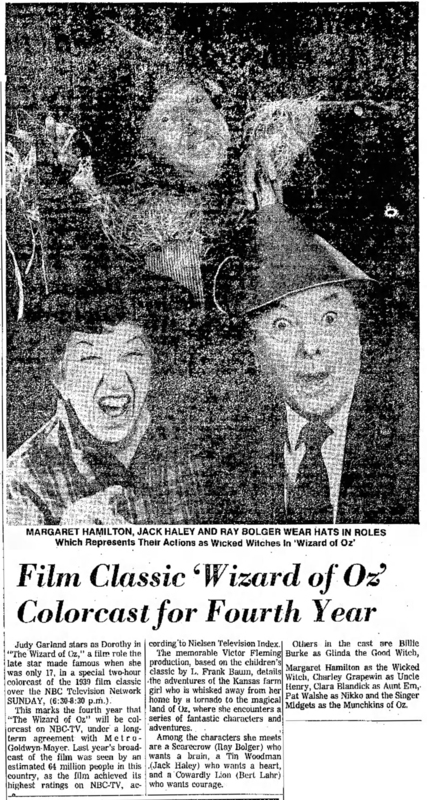 This broadcast was the fourth time it was “colorcast” on NBC-TV. 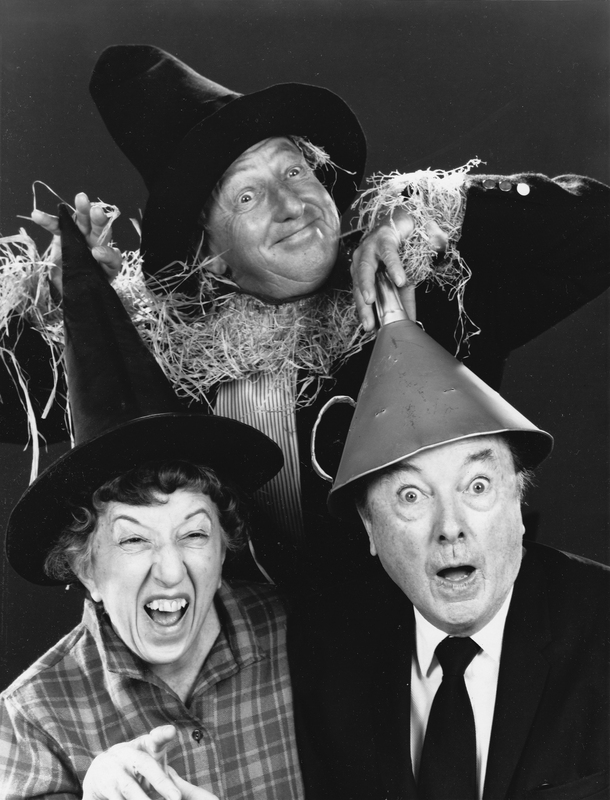 The first article features a recent photo taken of Margaret Hamilton, Jack Haley, and Ray Bolger for a 1970 reunion of the surviving main cast members. 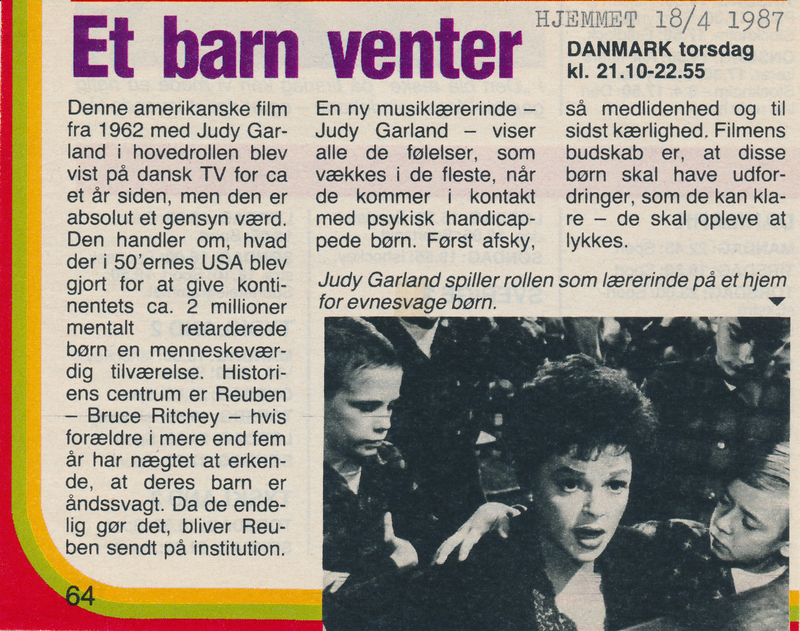 April 18, 1987: Here are three articles published on this date in Denmark about a TV showing of I Could Go On Singing.